In a way the Enlightenment, like many abstract concepts, was an “auberge espagnole”where customers were served what they had brought. That explains why the French Revolution or Rousseau have been considered a part of it by some and not by others. What is sure is that it was limited in time and space. Even in Europe, like electricity in a more recent past, it did not benefit the whole population. Nor was it permanent: it was probably out of date when Marie-Antoinette was beheaded or when the Napoleonic wars started. Tt is (Was ?) iialso, like nuclear power, a double-edged sword: one can make a good use of it or a less good one.beheaded or the Napoleonic wars started. Chanh, Uncharacteristically, I am able to agree with only about 50% of what you write (usually, I agree with 150% of your comments). I agree that the term “Enlightenment” is quite fluid, with lots of different versions and definitions floating out there. I agree also that at least until 1989, Enlightenment did have somewhat of a “double edged sword” effect, when Communist regimes (with less and less credibility in their waning years) could also claim to be descendants of the Enlightenment. But I don’t accept that the Enlightenment, however defined, was limited in time and space. 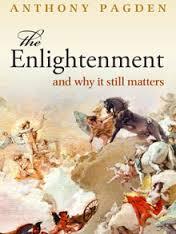 I think Pagden is dead right that our modern liberal democracies are the most enduring legacies of the Enlightenment. He says something to the effect that it is impossible to imagine our modern lives in the West without the Enlightenment (and there’s nothing inherently elitist about this legacy, since democracies are designed not to be elitist – the reality, of course may be other than the design). But think, as all of us were thinking in those giddy days of 2011, how wonderful it would be if something analogous to the Enlightenment were to sweep through the Muslim world, with its currents of equality and toleration. The core Enlightenment concepts of equality and toleration, across religious and national boundaries remain, in my view indispensable for a saner future across the globe. I’d hate to agree to disagree with you, Tom, but ours is a slight disagreement – about the consistency of human nature : I am a trifle more pessimistic or a trifle less optimistic than you are.